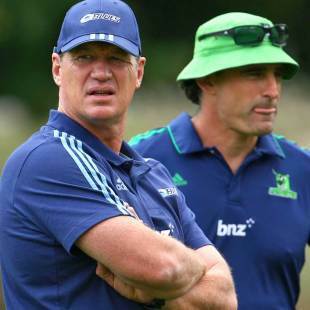 Blues coach Sir John Kirwan is keeping cool before his Super Rugby coaching record opens against the Hurricanes on Saturday night. His band of youngsters faces an arduous task against the highly regarded Wellington outfit, but he was showing no signs of pressure during a light-hearted field session on Tuesday morning. Kirwan was quick to pin the "underdog" tag to his men, saying the game was all about making a start and working to improve each week. "We just need to go down there and have a go; no pressure on us, all the pressure on them," Kirwan said. Simplicity in the game plan should allow raw talents such as fullback Charles Piutau to play a natural game, Kirwan said. "We're not ready yet but we will be by the time we get onto the plane to Wellington," Kirwan said. "I think we've had a pre-season where we wanted to make sure that everyone understood their roles and responsibilities, and we've done that. For me it's about creating an environment where they can express themselves. I want to see Charles [Piutau] smiling and I want to see him doing what he does." With the exception of All Blacks lock Anthony Boric, who will return to rugby in a game for the Blues development team on Friday night, the Blues will start their 2013 campaign with a full contingent of troops. "We just need to make sure he gets through that then he'll be available," Kirwan said of Boric. Chris Noakes is set to don the No. 10 jersey for the opening rounds of the season, but Kirwan said that he and replacement Bayden Kerr were each carrying a groin strain that would limit their goal-kicking abilities. Piri Weepu is expected to take on those duties instead. Kirwan said that "real competition" for positions had made the selection of a starting XV, which will be revealed on Thursday, extremely difficult. "I've asked the guys that they put us under pressure; they're a young team, everyone had a fair crack at it, and it was a hard team to pick," Kirwan said. "There will be guys that will be disappointed, but that's what we need."